Oct. 27, 2012 - In this article on how to study the Book of Revelation, Greg Laurie also touches on the timing of the Rapture of the Church, when believers will be caught up into the heavens to be with Christ. And it is my opinion that the next event on the prophetic calendar is the rapture of the church. The Bible says it will take place in a moment, in the twinkling of an eye. This could happen at any time, and it could happen soon. Oct. 20, 2012 - Plans are coming together for another version of the film "Left Behind." Nicholas Cage might star in the remake, which will begin filming next year. The revamped film will hopefully go more mainstream than the original series. The essential tenets of end-times theology will still be present. In fact, the film will remain Christian at its core, with the plot, once again, focusing on the survivors living in the hours after the Biblical Rapture. Two of America's biggest evangelical Christian broadcasters have stationed cameras on a hill overlooking Jerusalem, ready to cover the return of Jesus Christ from the Mount of Olives as predicted in the Bible, should any such event occur soon. The two broadcasters are Daystar Televisioon Network and and Trinity Broadcasting Network. "…the inspiration and inerrancy of the Bible, the virgin birth of Christ, the atoning work of Jesus' death, the physical resurrection of Jesus, and the historical reality of Christ's miracles." Dr. Tim LaHaye makes a case for adding a sixth funtamental truth: the teaching of Jesus' Second Coming! 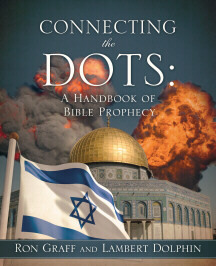 This doctrine is so pervasive in the New Testament, and so prominent in Church history that it should be considered just as important as the first five fundamentals..
July 14, 2012 - Joel Rosenberg gives solid biblical reasons for believeing the Rapture of the Church will take place before the Tribulation. One of his points is the fact that I Thessalonians, chapter 5 says that Rapture will happen like a thief in the night. It will happen as a surprise, when people are saying peace and safety. There's no way that people will characterize the Tribulation as a time of "peace and safety." Pre-Trib or Post Trib Rapture? Dave Hunt gives eleven reasons that a pre-tribulation rapture makes more sense than a post-tribulation rapture.